* The red line is US GDP (the sum of all economic output). 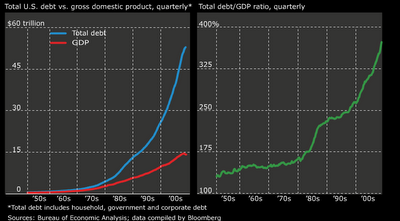 * The green line is the ratio of debt to GDP. Note that our ratio of debt to GDP spiked once in the mid-80s as the 1982 recession took a toll and military spending soared. However, we held that ratio of about 2-2.5 times debt to GDP until 2001 when things went haywire and we're closing in on 4x debt to GDP. On a related topic, the National Bureau of Economic Research said today that they may wait until they see significant improvements in the economy before calling the recession over. One NBER member said that the recession may last an additional 18 months and the recent upturn could be “in fact part of a larger decline."